Which Biome Will You Chose For Your Tree In The New World? I like Deserts, i really don't like rain. Propably jungle, thanks to the new height limit. Probably on a border between jungle and a village. Already have some awesome ideas for the tree. Shroom sprite here, wanted it ever sence I found out about the corruption. Hmmmmm... What if I could use shroom blocks as my building blocks! MWUHAHAHAHAHAHAHAHA. Though I'd need a silk touch pickaxe and bones to be that kind of shroom sprite. For those of you who want Jungle trees: be prepared for a sapling struggle :\ Wahya's had more luck than me; so far I've had about five trees not drop saplings at all, while the rest dropped only one or two. 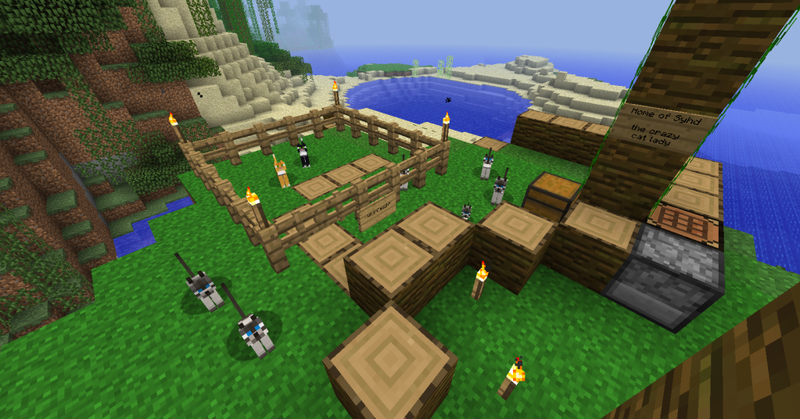 There's also a bug with cats; if you log out or /warp away from them while they're sitting, you might not be able to click on them again until you walk far away and then come back. Have you also found any villages NEAR a jungle biome? Cause i can't decide if i want a pure jungle or pure village elder tree. So i want myself a tree in a jungle near a village. Keyrath wrote: Have you also found any villages NEAR a jungle biome? Depends on how near you mean when you say near xD The closest I've found would probably take about a half stack of logs to reach. It's a ways off from spawn. :-/ Well, gotta look for one then... Would like one somewhere not tooooo far from the spawn, but well, can't have everything. I expect to have the server useable by this weekend. I won't have everything setup then, but people will be able to start their trees. Hopefully, by then, I'll also have some rearranging done on the forum, too. There is one thing I should mention beforehand. I don't think people should start their trees with a 2x2 jungle tree, so I've put that in the rules. You can grow your own with saplings from your smaller tree, but don't start with a big one. It just wouldn't be fair. Oooh! Aqua tree! Sounds awesome. Do like. I personally don' like the jungle biome as a starting tree biome. It's too crowded. Player grown 2*2 jungle trees contain vines. They do have vines on the trunk, but not on the leaves as far as I've noticed. Well, good to hear that.^^ Vines on the leaves won't do anyways cause you can't climb them to get up. But the big ones are long time investments then, i guess. You have to wait until the vines grow down if you don't want to build up something.